When I registered to become a member of then Zambia Fellowship of Reconciliation (ZAFOR), I had no idea the journey would culminate into a calling — my work for peace, justice and nonviolence — 21 years later. I have grown from an ordinary youth member to a national chair and proficient peacebuilding trainer and educator. While I greatly benefitted from a myriad of capacity building interventions, the firmer foundation that I received through the ‘Mennonites’ — service workers; regional representatives; and the alumni and faculty from Eastern Mennonite University — merits distinctive mention. My inaugural encounter with the Mennonite-affiliated peacebuilding practitioners and scholars was during my interaction with other African peace enthusiasts at the second Africa Peacebuilding Institute (API) 13 years ago at the Mindolo Ecumenical Foundation (MEF) in Zambia. As part of my diploma studies in peacebuilding and conflict transformation, this foundation was reinforced by the valuable expertise of my brother and mentor, Mr. Babu Ayindo, MA ‘98; Dr. Carl Stauffer, then regional representative for the Mennonite Central Committee (MCC) for Southern Africa; and DeEtte Beghtol, then MCC service worker seconded to MEF. 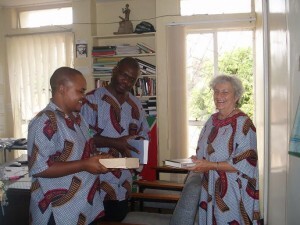 Kabale Ignatius Mukunto (left) with DeEtte Beghtol, former MCC service worker and Babu Ayindo, MA `98, as faculty at Zambia’s Mindolo Ecumenical Foundation in Kitwe. 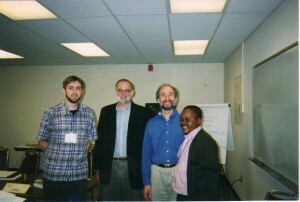 The formative leg of my peacebuilding journey was also “blessed” by the experiences of Eastern Mennonite University scholars, alumni and faculty including Mozambican brother Afiado Zungunza; Mzee John Katunga from the Democratic Republic of Congo (DRC); Mr. George Wachira, then director at Nairobi Peace Initiative-Africa; Krista Rigalo, MA ’00, and Fidel Lumeya, MA ’00, then MCC country representatives from Angola; and Barry Hart, a member of EMU faculty. With great respect, the foundation these people contributed started me off and to a greater extent set me on a firmer peacebuilding journey. Globally, there is growing recognition that efforts in peace and conflict scholarships in molding a generation of peacebuilding practitioners will steer the next century into peace and stability. Thus, it’s this Mennonite exposure that drives me to claim a stake in this generation of peacemakers. Africa’s future, and certainly Zambia’s, is not anchored on undemocratic systems, and visionless and corrupt leadership, but more visionary and selfless peace-loving practitioners. 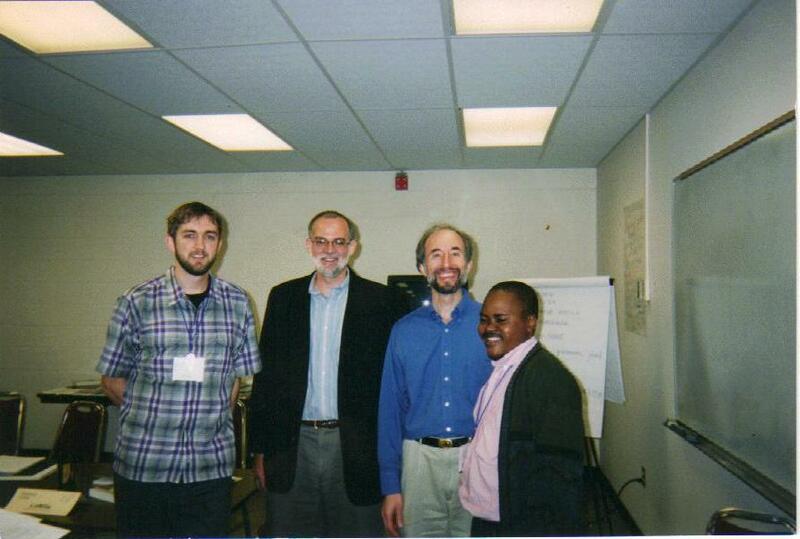 My stint at MEF was reinforced by a Winston Fellowship to attend the Summer Peacebuilding Institute (SPI) at EMU in 2003. This scholarship solidified my interaction and engagement with the Mennonites and peacemakers from other faith traditions, and provided benefits from the expertise of peace practitioners and scholars, notably professors Hizkias Assefa and Ron Kraybill. And one of my key take-aways from the 2003 SPI, particularly from these celebrated scholars, is the inspiration and renewed impetus to spread additional peacebuilding knowledge and tools. In sum, SPI gave me fresh cause to firmly contribute to cultivating positive peace in my seemingly peaceful country, Zambia. After two months of the Winston internship with Mindolo Ecumenical Foundation, I was formally engaged as an instructor. This new appointment once again laid before me valuable opportunities to collaborate with Mennonite associates, some of whom I co-taught courses with during regular classes and the Africa Peacebuilding Institute (API) courses. For several years, I served as a co-instructor during the API working with, among others, West African MCC representative and EMU alumni, Brother Gopar Tapkida, MA ’01, from Nigeria. My firm peacebuilding foundation laid through the Mennonite tutelage and association was a precursor to subsequent scholarly engagements in Durban, South Africa and San Jose, Costa Rica. The last several years, I have made my modest contribution to cultivating a culture of peace through trainings and workshops in Ethiopia, Japan, Rwanda, South Sudan (where I serve as an adjunct instructor at the RECONCILE Peace Institute), Uganda and Zimbabwe. Three years ago, I left MEF and joined the Dag Hammarskjöld Institute for Peace and Conflict Studies at The Copperbelt University as a lecturer. Despite exposure to other peacebuilding philosophies, I continue to appreciate the indelible orientation that the MCC/EMU-CJP alumni, colleagues and associates rendered continue to shape my peacebuilding vocation. I particularly share my subscription to conflict transformation versus conflict resolution or management. I have lately been sharing some of the resources with colleagues within the Institute, such as the Little Books of Justice and Peacebuilding acquired through my EMU exposure and contact. Anchored on the foundation, as part of my doctoral ideas, I work on transformative mediation and social conflicts within my context. I am particularly interested in the churches’ interventions (intermediary roles and contributions) and the effects on ameliorating social conflicts including gender-based violence. Descriptively, Zambia may be peaceful, but there are a myriad of socioeconomic issues including violence against women (widows and single mothers) that warrant attention. Demographic health studies shows that women suffer violence from the age of 15 and about 60% cases are attributed to violence by husbands or intimate partners. It may be disputed, but gender-based violence is a peacebuilding issue. And the need to explore transformative approaches (or assessing how transformative existing interventions are) to such conflicts is great. Ignatius Kabale Mukunto js a lecturer and Coordinator of the Human Rights, Governance and Peacebuilding Program, under the Dag Hammarskjöld Institute for Peace and Conflict Studies of the Copperbelt University, Kitwe, Zambia.